Looking for a highly specific antibody to detect phosphorylation events? Bio-Rad’s new Phospho-Specific PrecisionAb Antibodies have been validated by comparing phosphorylation levels in both treated versus untreated cell lysates and by dephosphorylating western blot membranes (Figure 1). The phosphorylation level quantification we undertake enables you to quickly determine the impact of cellular treatments and provides you with an easy way to judge the antibody specificity (Figure 2). Fig. 1. Western blot analysis of whole cell lysates probed with A, Mouse Anti-EGF Receptor Antibody (VMA00061) or B, Mouse Anti-EGF Receptor (pTyr1173) Antibody (VMA00752). It is followed by detection with HRP conjugated Goat Anti-Mouse IgG (1/10,000, STAR207P). Membranes were treated with (+) and without (-) lambda protein phosphatase as indicated and visualized on the ChemiDoc MP Imaging System. Fig. 2. Total Protein Normalization. Normalized signal intensity of EGF R (pTyr1173) from PVD treated and untreated lysates, treated with (+) or without (-) lambda protein phosphatase. 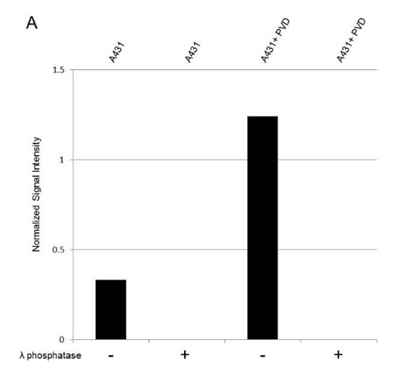 Lambda protein phosphatase dephosphorylates serine, threonine and tyrosine residues. Normalized signal intensity was calculated by dividing the TPN-normalized signal intensity for each phosphoprotein by the TPN-normalized intensity of the corresponding total protein. Learn more about TPN Total Protein Normalization. 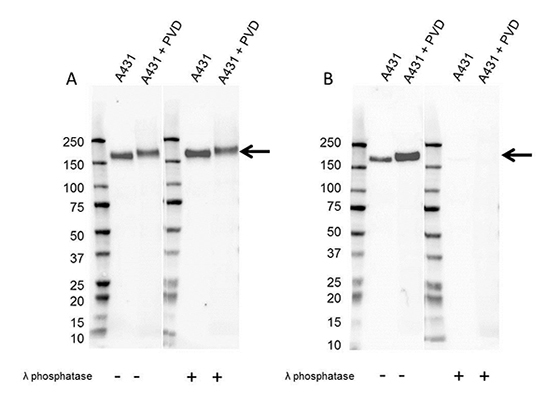 Unsure what total anti-protein antibody to use as a control in your phospho western blots? To showcase the different binding characteristics of phospho-specific and total protein antibodies, we have compared Phospho-Specific PrecisionAb Antibodies against total PrecisionAb Antibodies; this enables you to assess the impact of the different treatments and provides a control recommendation. The total and phospho-specific antibody can be purchased individually.